Zermatt in the Swiss Alps is situated close to the Italian border at the southern head of the narrow Matter Valley, which runs c. 35km directly south from Visp in the Rhone Valley. The town is surrounded by a horseshoe of the highest mountains in the Alps (after Mont Blanc in France), including the famous Matterhorn, which straddles the Italian border. Access for botanists in the summer is excellent. Zermatt is best known as a ski resort and is well endowed with lifts, cable-cars and a mountain railway, the main ones of which remain open during the summer. 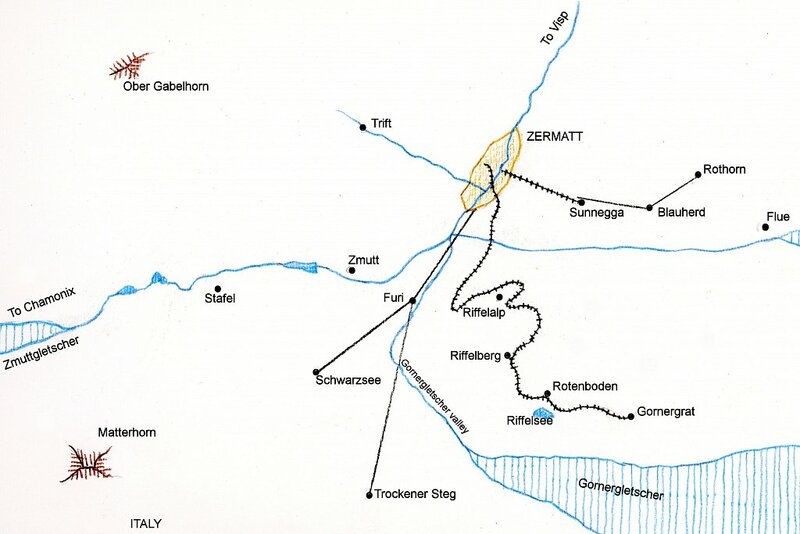 The mountain railway to Gornergrat terminates at the upper limits at which alpine vegetation can be found (in this region at least) at about 3000m. 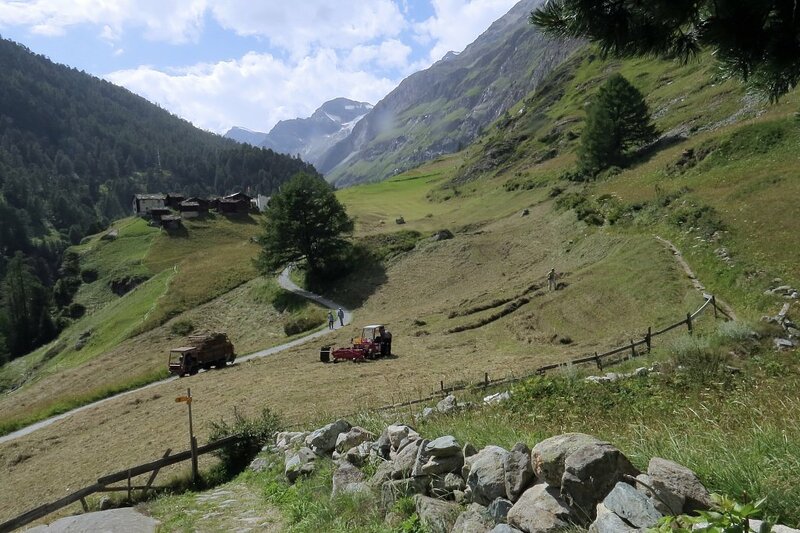 From each lift terminus there are long and mostly easy walks down the many well-maintained paths to the valley floor and giving excellent access to all the alpine habitats. Regular "watering holes" ease the descent. A pattern of smaller valleys radiating up from Zermatt divides the surrounding upland environment into four principal areas. Only three of these have lift-access. I identify these using the names of the main lift stations for convenience. These are Sunnegga (NE), Gornergrat (E) and Schwarzsee (S) situated at the base of the Matterhorn. On the west side of the valley, the land rises too steeply for skiing, so there are no lifts, but there is footpath access along the sides of the valley south to the little hamlet of Zmutt (W) and beyond, and a path from the town up the narrow valley to Trift. 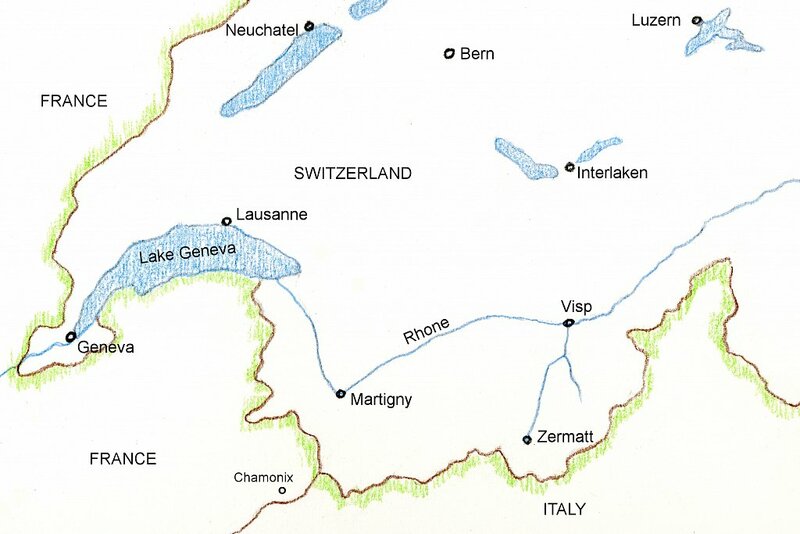 Of these dividing valleys, the one to the east side of the Matterhorn, between Gornergrat and Schwarzsee, leads by paths to the bottom of the rapidly receding "Gornergletscher" glacier; whilst the much longer valley north and passing west of the Matterhorn can be followed via Zmutt and Stafel in the direction of the "Haute Route" to Chamonix, France. Agriculture is limited to a fairly low level of grazing by cattle, sheep and goats. The vegetation of the valley floor comprises largely flower-rich hay meadow, cut in summer for winter feed. The relatively small area of this meadowland - and hence the small volume of winter feed harvested - is likely to be the limiting factor influencing the grazing capacity of the valley, and hence the grazing pressure on the vegetation. There is some pasture for cattle along the margins of the valley floor below the forest, but most summer grazing is above the tree-line. 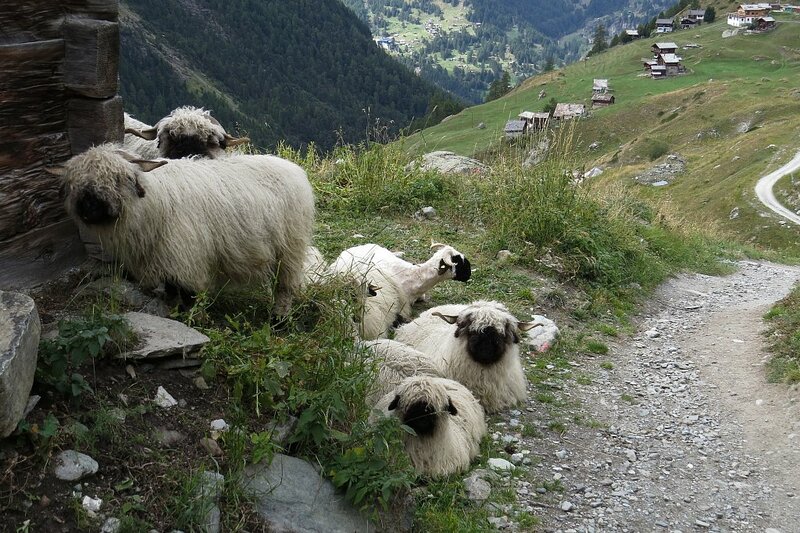 Small flocks of the Valais Blacknose Sheep are encountered. Some level of grazing is essential to maintaining the sward in an optimal state for supporting a diverse flora, and, as I understand it, these grazing levels are monitored and maintained for this purpose. 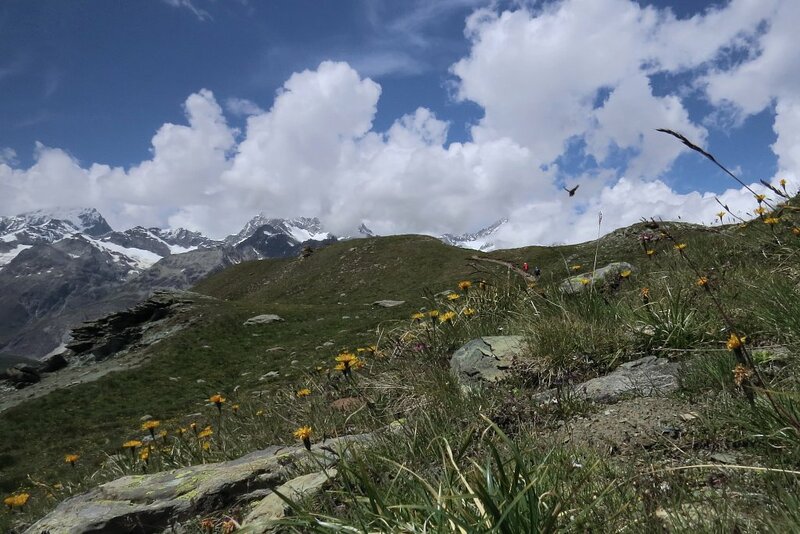 At the height of summer all the habitat to at least 3000m is free of snow - though an occasional flurry and even a day or two or settled snow can occur at any time. The first permanent snows usually arrive above 2600m in late October or early November, whilst the valley floor and the town, at about 1600m, may remain free of snow even into January (as in 2017!). At winter's end the valley floor may clear by April (as I remember in 1961), or the snow may persist well into May. 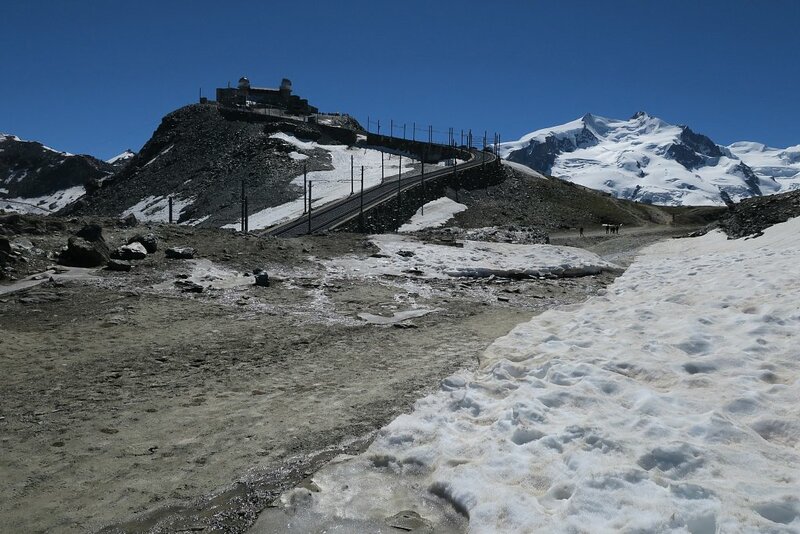 At 3000m snow cover will not usually clear until early July. As a result - which is of botanical interest - in mid-July one may experience early spring conditions at Gornergrat and high summer in Zermatt. Local climatic effects may also affect the development of the flora - cooling within range of the glaciers, for example. Rainfall is not high (611mm/24ins per annum - comparable with the driest area of the UK, East Anglia, and much less than half the average for Scotland), but variable enough to have a dramatic effect on the vegetation from year to year. At these altitudes dry conditions can lead to rapid desiccation of the vegetation. 2014 experienced a very wet early summer, resulting, as the weather warmed up, in a fantastic floral display by late July; whilst the hot dry conditions in 2015 burnt most of the vegetation to a crisp. In that year, some usually very common annuals, such as Eyebrights, were hardly in evidence at all; even the usually lush vegetation below the canopy in the north facing forests had wilted. In my experience winds are usually light - which is a great help when photographing plants! Regarding the changing climate, I have seen massive reductions in the glaciers since we first visited Zermatt as a family in 1961. In the hot summer of 2015, the river through Zermatt became a raging torrent of meltwater - keeping me awake in my hotel nearby. 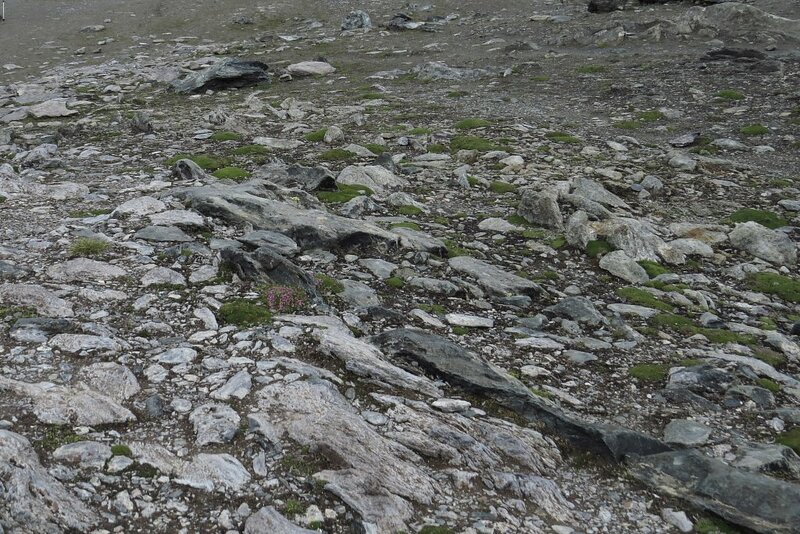 At Gornergrat (3000m) the habitat may be snow-free for no more than 4 months of the year, resulting in poor soil development with much exposed rock (photo below). Only sparsely distributed snow-patch and scree plant communities are supported on the thin exposed soils (vegetation usually requires at least 3 months clear of snow to establish). 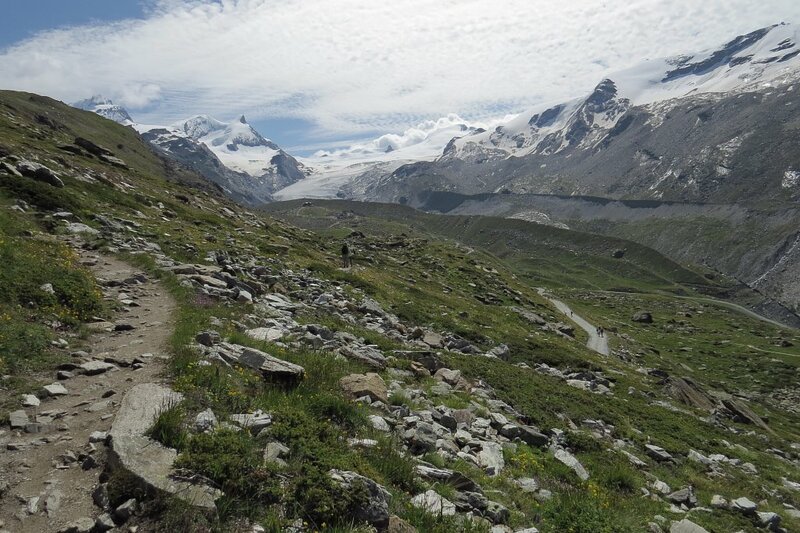 Descending to RIffelberg (2600m), the snow-free period quickly lengthens and soil development improves. The sward of this increasingly herb-rich grassland closes up but remains short. Below 2600m and into the upper reaches of open forest at the tree-line (2200m), taller grasses and herbs appear in mosaics with short shrub vegetation, mainly Juniper and Rhododendron and occasional patches of Heather (Calluna). The forest (principally Arolla Pine (Pinus cembra), Larch (Larix decidua) and Norway Spruce (Picea abies) with its diverse ground flora lies in fairly narrow bands on steep ground below 2200m. Silver Birch (Betula pendula), Aspen (Populus tremula) and Green Alder (Alnus viridis) are also found. As the ground levels onto the valley floor (1700m), the forest is replaced by the tall herb-rich hay meadow and some grazing pasture. Rock and cliff habitats supporting species such as Saxifrages (Saxifraga) may be encountered at any altitude. New areas of habitat - stony with as yet poorly developed soils - are being formed as the glaciers recede. Here species such as Fleischer's WiIlowherb (Epilobium fleischeri) and Statice-leaved Hawkweed (Hieracium staticifolium) are prominent amongst early colonisers. Trees, especially Larch and WIllows are also colonising these habitats slowly. Wetland habitats are limited to small lakes, glacial rivers, streams and occasional wet flushes. The waters of the lakes and streams are unvegetated, though there is a characteristic bankside flora and some emergent vegetation (mostly sedges) along some lake margins. The wet flushes, on the other hand, are well vegetated and are oases for plant life during very dry periods. The ever expanding (!!) town of Zermatt provides habitat for lowland species favouring disturbed ground, such as Shepherd's Purse (Capsella bursa-pastoris), Equal-leaved Knotgrass (Polygonum arenastrum) and Greater Plantain (Plantago major). Civil engineering projects reaching to higher altitudes (new roads, lifts, hydroelectric schemes) are also tracked by the expansion of these and other more invasive species such as Rosebay Willowherb (Epilobium angustifolium) and Colt's Foot (Tussilago farfara). The Geology of the area is a mixture of sedimentary and volcanic rocks. Both nutrient-poor acidic and base-rich soils are produced, each with their characteristic floral communities. Along the west side of the valley, between Zermatt and Zmutt (and beyond), there are bands of exposed calciferous cliffs (I think), showing a distinctly calcicole flora on the soils below.